On December 20th, 2014, two New York City Police officers, Wenjian Liu and Rafael Ramos, were gunned down. Their killer had traveled from Baltimore with the hopes of killing some police. They were ambushed and essentially executed. At their funeral in early January, an unusual sight was pictured by many. Around ten thousand police had come to line the streets for the funeral. 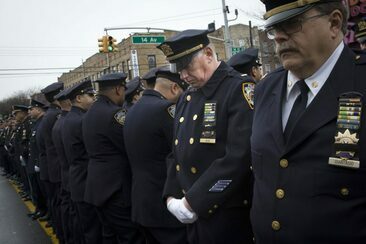 When Mayor De Blasio of New York eulogized the officers, thousands of those police officers turned their back on the Mayor as he spoke. They wouldn’t face him. It was a huge sign of disrespect by police officers who believed that the Mayor’s political stance led to the executions of the police officers. Even the gunman acknowledged that the Mayor’s stance had emboldened him to do what he did. This sign of disrespect will be remembered by many New York police officers for years to come. Turning your back on someone is not only a sign of disrespect. It is a sign of utter disgust at the other person to whom you show your back. It is a statement of rejection and a public sign of humiliation to the person who is turned away from. In our scripture, God had seen terrible sins committed by the people of Israel and Judah. Their sins were the equivalent of showing God their backs. As the sins mounted, God spoke through the prophet Isaiah a warning. In our scripture for today, God demanded that the people (along with all the earth!) “turn” to face God and “be saved” (Isaiah 45:22). Through the prophet, God said, “I am God, and there is no other.” God in Heaven loathed seeing His people sin against Him, disown Him, disrespect Him, and reject Him. God wanted the people to turn and face Him. He wanted them to follow His voice. There was no other way they could be saved. When Jesus was ministering and teaching in the area of Capernaum, he also noticed rebellion among His followers. John 6:66 mentions this rejection saying, “After this many of his disciples drew back and no longer went about with him.” Seeing many abandoning His ministry, Jesus asked the twelve disciples if they wished to go away as well. Peter spoke up courageously on that day saying, “You have the words of eternal life!” (John 6:67). The disciples clung tightly to Jesus, displaying their true colors. There will come a time in your life when you find yourself making a decision about whether to face God or turn your back to God. When a sin has taken hold in your life, you might be tempted to follow the sin and turn away from God. When bad things happen to you, you might feel like God doesn’t care and desire to give up your faith. When following God becomes difficult, you might be tempted to just walk away from your commitments. During difficult moments, you will have to choose to either look to God or turn your back upon Heaven; and God will pay particular attention to which direction you face. Joni Eareckson Tada grew up in Baltimore, Maryland riding her bike, playing tennis, and swimming. She loved going for long walks and enjoying the outdoors. However, her life was changed in 1967, when she dove into the waters of Chesapeake Bay. She misjudged the depth of the water while diving and injured her spine. She became a paraplegic. In the intervening years, limited by her illness, she has had many difficult adjustments to make. She has to be helped often. Her wheelchair can get uncomfortable. The corset she wears to keep her erect can restrict her blood flow and dampen her breathing. While being interviewed for an article for Christianity Today, Joni mentioned that she often thinks her life is just plain too hard. One day, she said to her secretary, “I want to quit this”, meaning her suffering. In those difficult moments, she has found that turning to God brings her great hope. Facing Heaven, she prays and finds the courage to continue on with her life and work and ministry. Facing toward God or away from God will define your life. Others will notice which way you face. God will notice which direction you turn. God enjoys seeing your faithful face. Why would you ever think of turning away from such love?